A MASSIVE wave of protests shook Australian cities as part of the global day of action against war. No one expected them to be so big. The weekend began with what would have been the largest anti-war demonstration ever in this country. CENTRAL MELBOURNE came to a total halt on Friday evening as a quarter of a million Victorians massed against the war. The turnout represented one in 10 adult Melburnians. The demo easily dwarfed the largest moratorium march against the Vietnam War in 1970 and the 150,000-strong union rally against Jeff Kennett in 1992. Michele O’Neil, state secretary of the textile workers’ union, opened the rally, declaring that war was wrong, with or without United Nations support. She received thunderous applause. Victorian Trades Hall Council secretary Leigh Hubbard and Democrats senator Natasha Stott Despoja were among those who made the same point. Victorian Peace Network organiser Damien Lawson called for civil disobedience and industrial action to stop the war. Construction union state secretary Martin Kingham was loudly cheered when he announced that Trades Hall had voted for a lunchtime stopwork rally on the first working day after war breaks out. As the first marchers filled Federation Square, the rear of the demonstration was still six blocks back, with protesters swamping Swanston St from shopfront to shopfront and blocking side streets. Many stood patiently in the heat for two hours only to go home without marching. Hundreds of high school students went on strike earlier in the day to protest. Unions including teachers, construction workers, metalworkers, liquor trades, textile workers, electricians and public servants marched to join the rally from Trades Hall. The rally united young and old, Christian and Muslim, white collar and blue collar. Other speakers included Greens leader Bob Brown, federal Labor MP Maria Vamvakinou, singer Peter Garrett and 17-year-old Kurdish refugee Ala Ismail. There were hundreds of homemade placards attacking Howard and Bush, street theatre and puppets like those on anti-capitalist demonstrations. Long after the speeches had finished, protesters were still dancing and celebrating the size of the movement in Federation Square. The Melbourne demonstration set the pattern of the biggest ever anti-war protests in city after city as well as smaller towns up and down the country. 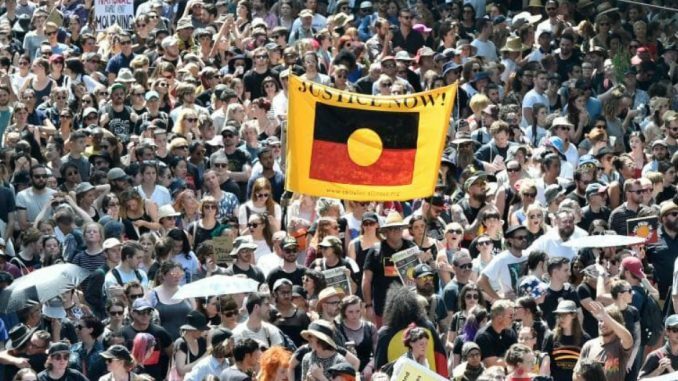 Organisers say up to 100,000 protested in Adelaide, 100,000 in Brisbane, 20,000 in Perth, 15,000 in Canberra, Hobart and Newcastle. They were joined by 5000 in Lismore, 3000 in each of Byron Bay, Bellingen and Armidale, 2000 in Cairns, 1500 in each of Darwin and Mackay. Protests were also held in Rockhampton, Geelong, Kempsey, Nambucca and Foster and the Sunshine Coast. The biggest demonstration of all took place in Sydney. More than 350,000 filled Hyde Park and spilled into Elizabeth and surrounding streets. The march was a huge carnival of people power and homemade signs. Veteran journalist John Pilger received deafening applause and cheers when he spoke of the power of the demonstrated by ordinary people challenging war. “What’s wonderful is that the plastic patriots and their propaganda have failed. This weekend more than 30 million people all over the world are doing what you’re doing. They are your comrades. Two million people in London. Five million people across the continent. Forty-two US cities. Never has there been such a massive opposition to a war before it began. Never has there been such a world-wide resistance to the terrorism of state power. Let me assure you finally – our movement is too big to be defeated. This is not to say that the Bush gang can be stopped immediately. But the power of public opinion, the moral power and the political power – your power – is far greater than perhaps even many of you realise. Howard fears public opinion, Bush and Blair fear public opinion. That’s why their propaganda is so virulent and their apologists are so shrill. They prefer the old lie that people are apathetic-some apathy. Let us reassure Bush, and Howard and Blair that they have every reason to be afraid.